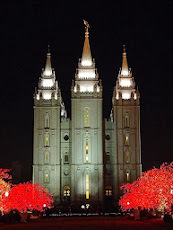 SALT LAKE CITY, UTAH, December 29, 2015— FamilySearch.org, an outstanding free website hosted by FamilySearch International, the foremost family history organization in the world, has released a 2015 year-end summary of its global efforts to ultimately connect families across generations. It has made substantial progress in creating new personal and family discoveries through significantly more access to historical records, expanded partnerships, a more powerful and user-friendly online search experience, and hundreds of free localized events hosted worldwide. For more than 100 years, FamilySearch and its predecessors have gathered and preserved worldwide records, creating the largest collection of genealogical and historical records in the world. It continues to digitally convert its vaults of microfilm for online viewing, along with millions more newly captured record images from archives across the globe. In the past 25 years, it has been influencing technology and initiatives that engage a broadening swath of consumers to have emotional, endearing experiences with their family and family history. It uses its nonprofit status to continue to rally the growing sea of commercial companies—large and small—in the genealogy and family markets to join in the noble efforts. During 2015, Steve Rockwood took the reins of FamilySearch, replacing retiring Dennis Brimhall as CEO. Two Family Discovery Centers, which represent a new concept inpresenting family history information, were opened in Salt Lake City, Utah, and Belleview, Washington. Ground was also broken for a new FamilySearch Library in St. George, Utah, which will have some of the new discovery center experiences. RootsTech 2015, a global family history event held in Salt Lake City, Utah, and hosted by FamilySearch, uses technology and fun experiences to expand family connections. It attracted a record 300,000 attendees in person, online, and through local post–Family Discovery Day events. During 2015, FamilySearch, in cooperation with several other organizations, launched the Freedmen’s Bureau Campaign (discoverfreedmen.org) to finish digitizing and indexing Civil War–era records that are crucial to African American research success. This project should be completed in 2016. On October 23, 2015, FamilySearch celebrated the 30th anniversary of its well-known FamilyHistory Library in downtown Salt Lake City, Utah, which houses the largest and most expansive collection of family history records in the world. Hundreds of thousands of patrons still frequent the facility from around the world. The My Family: Stories That BringUs Together booklet, which was launched in 2014, provides an engaging way to capture and preserve family trees—particularly for those individuals and cultures who are less tech-savvy. In 2015 the number of languages the popular booklet was published in was expanded to 42. More and more people made use of the local 4,891 FamilySearch facilities (family history centers) in 2015. North America alone has seen a 25 percent increase in attendance at these local libraries during 2015. Online, FamilySearch.org has seen 291,806 visitors daily—an increase of 19 percent. New patron discovery experiences have been launched in family history centers worldwide during 2015, and 1,505 local post–RootsTech family discovery day events were held. Enhancements were introduced to the FamilySearch.org Family Tree to assist patrons in creating more accurate records and to find records of their ancestors more easily. The site has introduced a redesigned landscape pedigree view, easier access to indicators in other tree views, and safeguard reminders to help patrons avoid making common editing mistakes. The indicators clearly show possible data problems for an ancestor and opportunities to provide missing information and help to locate missing ancestors. Dynamic record hints were added through the Search feature at FamilySearch.org to aid patrons in making new research discoveries. The hints are more plentiful as they comb through the mountain of new historic records added weekly to the site from its global records preservation efforts, and the interface has been improved to easily follow through with or dismiss hints. Over 670 million new patron hints were generated during the past year. Through partnerships with other major online genealogy sites, patrons can now use a single click to search ancestry.com, findmypast.com, and myheritage.com for the person they are viewing in FamilySearch’s Family Tree. This year’s FamilySearch innovations have made searching and recording personal and family experiences more user-friendly and have improved the accuracy of FamilySearch’s databases. Searchers can use improved exact matches in their search criteria to more easily locate records, attach records from search results to people in their Family Tree, and gather and sort information in the new hybrid view that combines historical records with their corresponding indexed information. More than 120,000 new contributors added to Family Tree in 2015, making a total of 2.47 million. The new user-to-user messaging feature in Family Tree simplifies collaboration with others doing research on the same specific ancestors. There are now 1.1 billion persons in the FamilySearch Family Tree. FamilySearch carries out its mission through a dedicated team of employees and overwhelming contributions of time by volunteers. FamilySearch has enabled the public worldwide to use its constantly expanding record collection to make family connections through 4,891 satellite family history centers in 129 countries, with 2,864 of those satellite centers located outside the United States. That’s an increase of 15% over 2014. The site launched 158 new historical collections in 2015, (bringing the total to 2,049), and hundreds of millions of new published records have been added to FamilySearch.org. Personal discoveries are fueled by making historical records easily and quickly accessible online. FamilySearch does this through a combination of digitizing the world’s historical records online and engaging online volunteers to make them searchable by patrons worldwide with a few keystrokes. Around the world, 319 camera teams—an increase of 11%—digitally preserved over 122 million records in 45 countries, and 304,000 online volunteer indexers helped make them searchable. In fact, volunteers logged in over 9 million hours and indexed over 106 million records in 2015. And 19 million of the records indexed were of international origin, in languages other than English. At the end of 2015, FamilySearch.org now has over 5.31 billion searchable names in historical records. The FamilySearch Tree mobile app now enables users to attach photos and stories (audio and text) to individuals in their Family Tree and to receive notifications when others add content to specific individuals. The new memories gallery view allows users to more easily organize, sort, and add photos, stories, and scanned documents to their memories collections. Last year patrons uploaded 4 million personal family photos and 40,000 new family stories. Volunteerism is one of FamilySearch’s greatest assets. In addition to online volunteers, 3,850 volunteers serve as FamilySearch missionaries, helping support the worldwide operations needs. These generous volunteers donated a staggering 3.04 million hours of service. FamilySearch joined with the Smithsonian National Museum of African AmericanHistory and Culture and other organizations to index and publish online the Freedmen’s Bureau records, a Civil War era collection that will prove very pivotal for African American research success. A record 12,000 volunteers have enlisted online to assist (see DiscoverFreedmen.org). Patrons needing help can get immediate assistance by telephone (one-on-one to online volunteer assistants,) by viewing the hundreds of free video courses online, and by accessing the FamilySearch Wiki, an online reference source with over 100,000 helpful articles that are updated weekly. FamilySearch enhanced its online help system in 2015. Users will now notice slide outs that provide contextual help in key areas on the site where users might need it the most. FamilySearch also added 77 new family history centers around the world to provide free personal research assistance to patrons. Access FamilySearch’s free services online at FamilySearch.org. FamilySearch International is the largest genealogy organization in the world. FamilySearch is a nonprofit, volunteer-driven organization sponsored by The Church of Jesus Christ of Latter-day Saints. Millions of people use FamilySearch records, resources, and services to learn more about their family history. To help in this great pursuit, FamilySearch and its predecessors have been actively gathering, preserving, and sharing genealogical records worldwide for over 100 years. Patrons may access FamilySearch services and resources free online at FamilySearch.org or through over 4,891 family history centers in 129 countries, including the main Family History Library in Salt Lake City, Utah. Note: This is a repost from December 23, 2014. 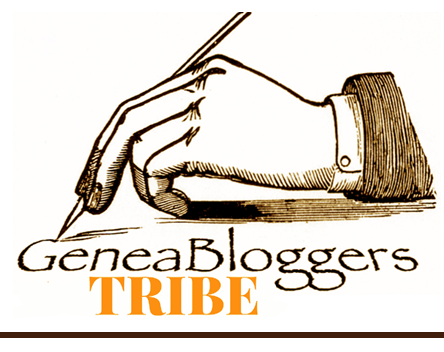 This is part of the "Advent Calendar of Christmas Memories" by Thomas MacEntee of GeneaBloggers. If you'd like to join in the fun, just click HERE. If someone dropped out of the sky and was unfamiliar with the concept of Christmas, how would you explain it to them? Can you put the meaning of Christmas into words? What does Christmas represent to you and is it different than when you grew up or from the meaning it had for your ancestors? Tell us what Christmas means to you and your memories of Christmases past. I love Christmas. It's a very special time of the year that we celebrate the birth of our Savior, Jesus Christ. Because He was born in Bethlehem so many years ago, and because He fulfilled His divine mission here on earth, we all have the opportunity to return to live with our Heavenly Father again. I'm eternally grateful to our Heavenly Father for the gift of His Son, Jesus Christ. Please enjoy this beautiful video that tells the Christmas Story. A note to my wonderful readers: Due to the Christmas and New Year holidays, Fab Finds will be on hiatus until January 8, 2016. A very Merry Christmas and Happy New Year everyone! The Owl by Debi Austen, author of Who Knew? One of our family's favorite treats is See's Fudge. I've been making this fudge for years and years. I couldn't even tell you how many pounds of fudge I've made since I started making and sharing this fudge with our family and friends at Christmas. The recipe was given to my mom when I was a child. I don't know if it's really a recipe from See's or not. 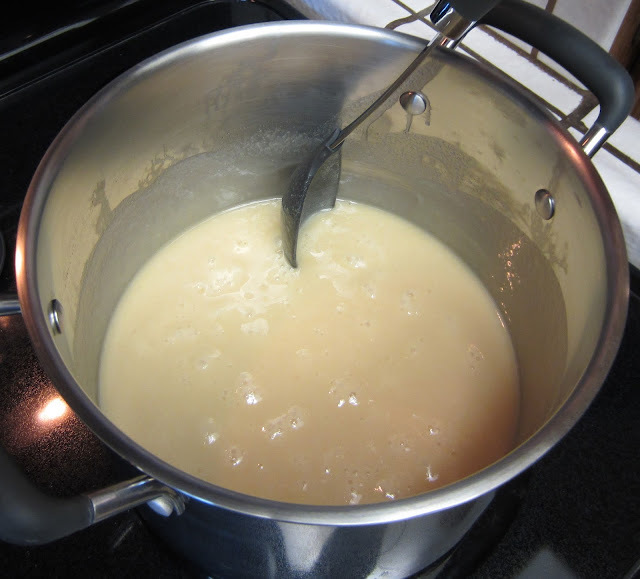 It has a smooth creamy texture and is delicious and quite popular with my family and friends. 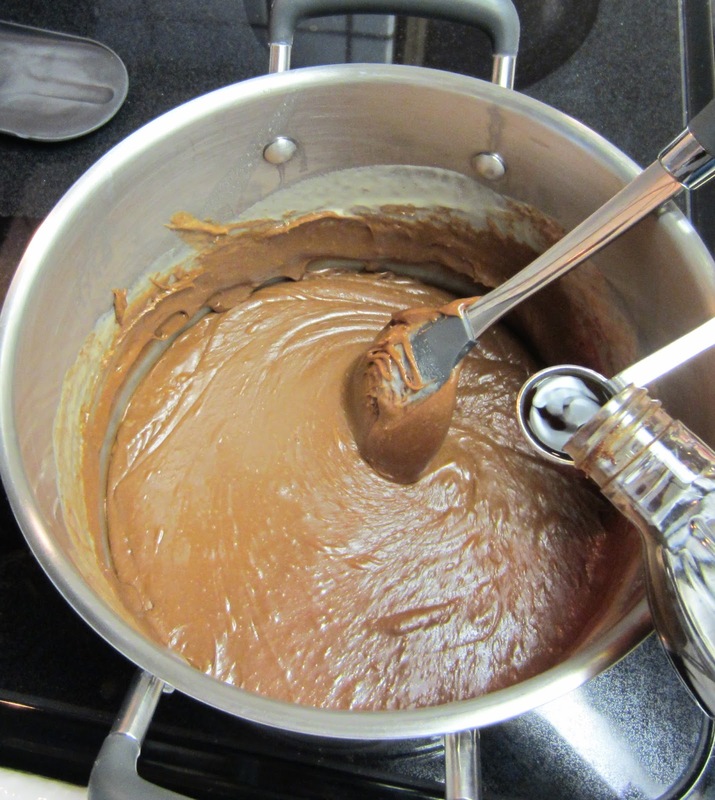 Here's what you need to make this delicious See's Fudge recipe. You can also include chopped nuts if you'd like. An important note: make sure to measure out your ingredients BEFORE you begin cooking the fudge on the stove. After measuring the ingredients, butter the stock pot and 13 x 9 inch pan. Before turning on the burner, add the evaporated milk and sugar. Turn the burner on to medium heat. Stir the mixture constantly. I also scrape the sides of the stock pot as I stir. As soon as you start to see bubbles forming (see the little bubbles in the pot below? ), set the timer to 8 minutes. It's important to set the timer as soon as you start to see bubbles forming and not wait until the mixture comes to a full rolling boil. Continue to stir constantly. Look at all of those bubbles! That's what you want. Keep stirring constantly. When the 8 minutes is complete, remove stock pot from burner. Add the butter and marshmallows first. Stir until they are mostly melted. Add vanilla and stir again. Immediately pour into prepared 13 x 9 inch pan. You'll need to work fast because the fudge will start to set up quickly. Spread in the pan and place in the refrigerator. Let the fudge set up in the refrigerator for several hours or overnight. 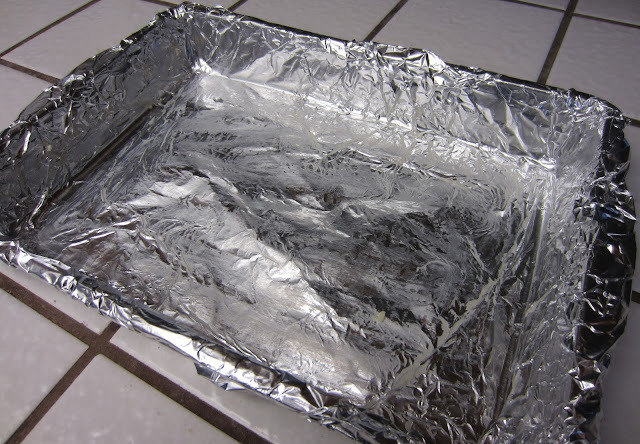 When ready to serve, remove the foil insert from the pan and cut into squares. Enjoy! 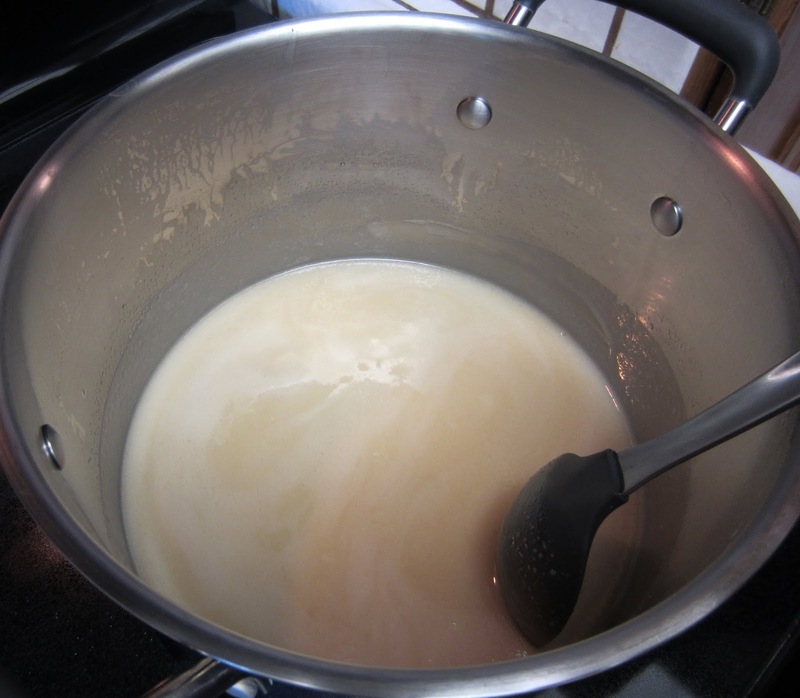 Pour evaporated milk into buttered stock pot. Add sugar and stir together. Turn burner on to medium setting. Stirring constantly over medium heat, bring sugar and evaporated milk to boil. As soon as the mixture begins to boil, set timer for 8 minutes. Do not wait for a rapid boil before setting the timer. Set the timer as soon as bubbles begin to form. Boil for 8 minutes while stirring constantly. 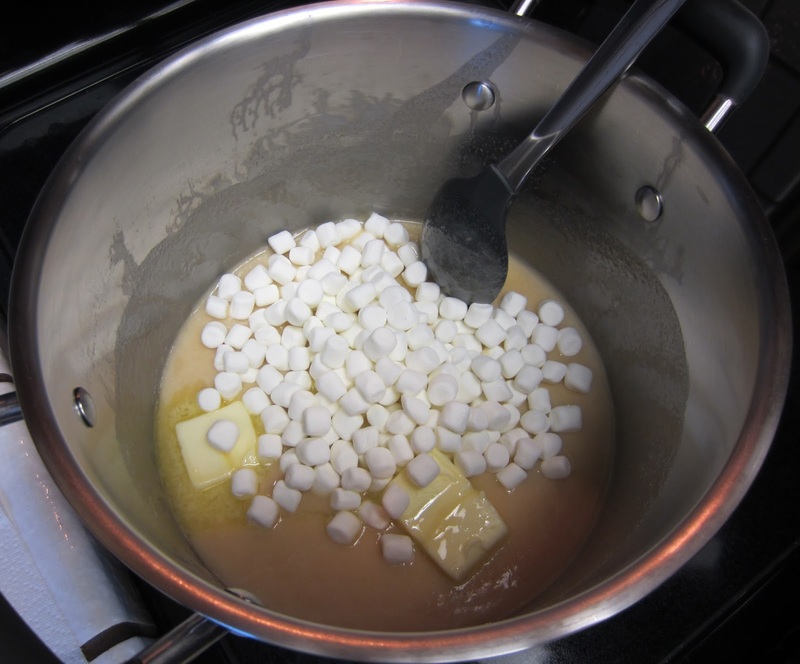 Remove from heat and add butter and marshmallows. 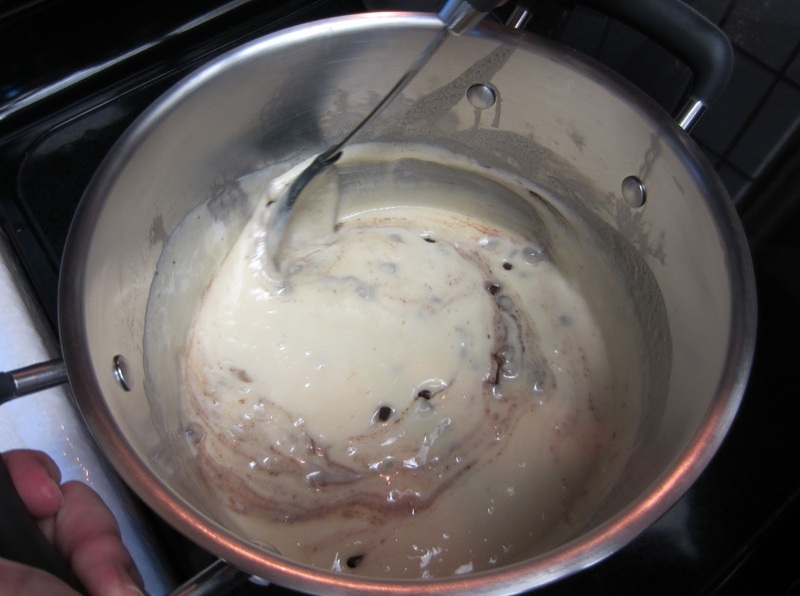 Stir together until mostly melted, then add the chocolate chips and walnuts. Stir well and add 1 tsp. vanilla. Immediately pour in pan and refrigerate. Note: For easier cutting of fudge, I line the 13 x 9 pan with heavy duty foil and then butter the foil at the same time I butter the stock pot. 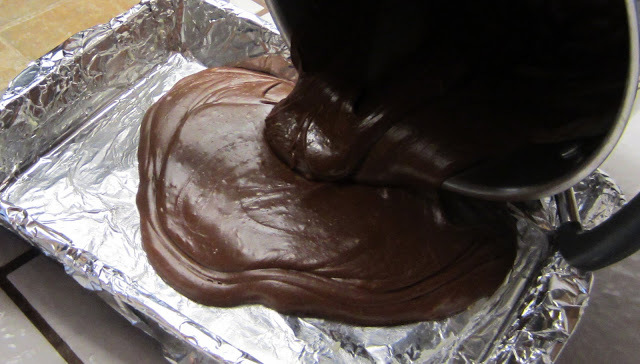 Simply pour the fudge into the foil-lined pan and refrigerate until firm. Once you're ready to serve, remove the fudge block out of the pan and cut into pieces. Wrap any remaining fudge in foil and place back in the refrigerator. SALT LAKE CITY, December 15, 2015—Organizers of RootsTech, the largest family history conference in the world, are pleased to welcome popular lifestyle bloggers Josh and Naomi Davis (of the Love Taza website), as keynote speakers in the general session on Friday, February 5, 2016, during RootsTech 2016. 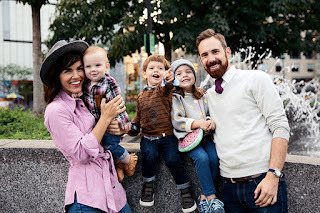 Millions of Internet viewers know Naomi as Taza as they follow her blog Love Taza, which celebrates the joy and purpose she and her husband, Josh, share as they raise their three small children in New York City. She started the website shortly after marrying Josh in 2007 in New York City while she finished her BFA (bachelor of fine arts) degree at the Juilliard School. She shares photos and stories of her life as a newlywed with her family out West. Since 2007, Love Taza has become more than an online diary—it is a digital destination where millions around the world connect and find a feeling of inspiration and a guide for finding joy in everyday life. Naomi shares details of her life in New York City with her husband and children celebrating family, home, travel, food, and, most importantly, the simple joys of life. With Josh’s help, the two have transformed her website into a global business with a massive, engaged audience. Josh and Naomi will share their business journey at RootsTech 2016, a global family history event where people of all ages learn to discover, share, and celebrate their family connections across generations through technology. 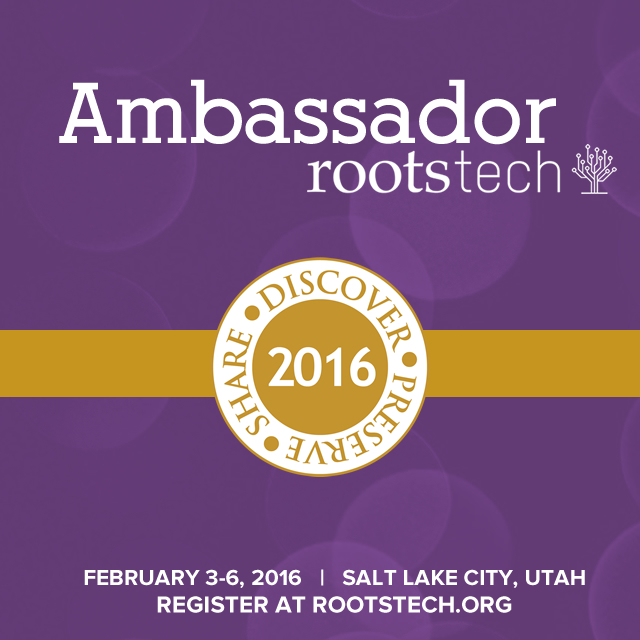 RootsTech has something for everyone regardless of experience in family history or skill level in technology. Reserve your seat for RootsTech 2016 to find inspiration from the Davises as part of a four-star lineup of keynote speakers, get involved in the special events, and learn from the experts the how-tos of family history, family stories, and more. Join us for all the events on February 3–6 at the Salt Palace Convention Center in Salt Lake City, Utah, or choose your day to join the excitement. Register early for a discount, or pay at the door. For more information and to register for RootsTech 2016, go to rootstech.org. Advent Calendar Prompt from 2015 - Do you have unique decorations that you use each Christmas? How did you get them or were they passed down to you from family members? Do you have certain traditions surrounding Christmas decorations such as purchasing one from every state or country you visit? Describe your favorite decorations! Tell us about your Christmas decorations and your memories of Christmases past. Our Christmas tree is decorated with traditional round ball ornaments such as you'd find at your local Target or other department store. But, we also have special Christmas ornaments that we've collected or have been given over the years. I'd like to share a few of those with you today. In previous Advent Calendar of Christmas Memories posts about Christmas tree decorations, I mentioned that I remembered some painted glass bird ornaments from my childhood. They were clipped onto the Christmas tree branches and had decorated bristle-like tails. I inherited one of those birds from my parents. It's a very special heirloom ornament. This is our Fresno California Temple ornament. On April 9, 2000, the Fresno California Temple was dedicated. Our family was able to attend the groundbreaking for the temple on March 20, 1999. During the temple's construction, our family visited the temple site and took pictures. I made a scrapbook that contains those pictures and other items. We are so thankful to have a temple near us. Before the Fresno California Temple was built and dedicated, we attended the Oakland California Temple, which is about three hours north of us. I made these ornaments years ago. 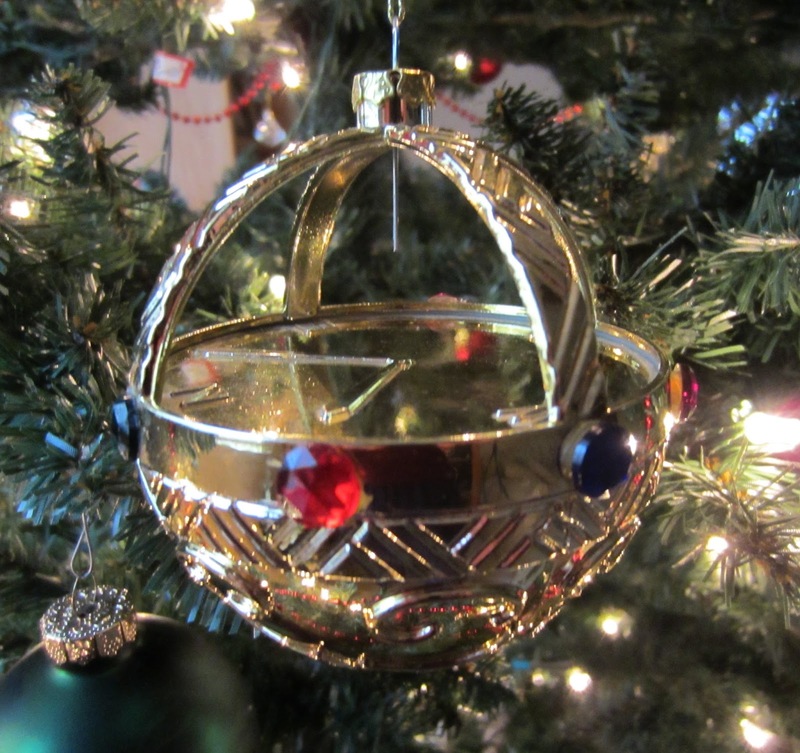 They are round and egg-shaped glass ornaments covered in a gold mesh fabric. This lovely Nativity Scene ornament was given to me by my sweet friend Ann who lives in Ireland. Ann is the wonderful person who found and gave me many of the Engle Family postcards I now have in my possession. If you haven't read about the amazing story of these postcards, click HERE. This is our Liahona ornament. It's a beautiful shiny plastic ornament. In the Book of Mormon, there is an account about Lehi, a Hebrew prophet, who found a brass ball outside of his tent door. This brass ball was called the Liahona and was given to Lehi and his people by the Lord. The Liahona provided direction and spiritual instruction to Lehi and his family. To learn more about the Liahona, click HERE. This beautiful glass ornament decorated with fruit was given to us years ago by some friends. My friend Sue bought this beautiful ornament for me when she visited Amsterdam several years ago. This sweet and simple Nativity Scene ornament has graced our Christmas tree for many years. We purchased these ornaments while we were vacationing in Disneyland. This is our glass bells ornament. We've had it for years. I don't even remember when we bought it. This is our white dove ornament. Do you have special ornaments on your Christmas tree? German Pancakes have become a Christmas morning breakfast tradition in our family. I don't even remember exactly when or from where I got the recipe. It's included with a bunch of recipes on a two-sided photocopy paper. What I do know is that these pancakes are delicious. It's fun to watch the German Pancakes puff up while they bake in the oven. They deflate pretty fast once they're removed from the oven though. But that's okay. They're still really yummy. We serve them with sifted powdered sugar and maple syrup. Here's the recipe. I hope you enjoy these German Pancakes as much as we do. Melt the butter in a 9 x 13 inch pan. 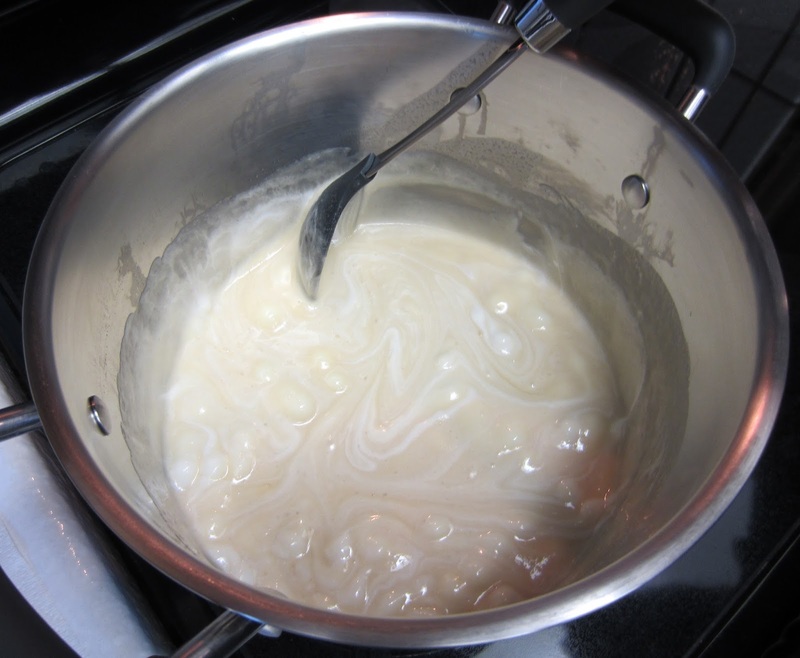 Whip remaining ingredients together (don't puree) and pour into melted butter in pan. Bake at 425° for 20 minutes. It puffs up around the edges and can be topped with syrup, peaches, pears, etc. Sepia Saturday: "I am well" by Wendy Mathias, author of Jollett Etc. THE FLESH IS OH SO FRAIL! NOTE: This is a repost from December 10, 2014. So many of us have family traditions related to Christmas that we learned as children and we still keep to this day. Do you know how your traditions started – is there a “backstory” to each one? What about starting new traditions – how do you start and then keep the tradition going? Are there any traditions which you disliked and that you refuse to keep? Tell us about your family’s Christmas traditions and your memories of Christmases past. In this post, I'm not going to share Christmas traditions from when I was a child, but from my own family as a parent. My husband and I have five adult children. When they were young, we would gather together in the family room and read about Christ's birth from the scriptures. Our daughter would dress up as Mary and our four boys would dress up as Joseph, the wise men, and the shepherds. When they got older, they wouldn't dress up, but we'd still read the Christmas Story from the scriptures together. It was a special way to remind our children, and ourselves, of the real meaning of Christmas. Several years ago, we began another tradition. We started having German Pancakes for breakfast on Christmas morning. These pancakes are baked in the oven and grow puffy as they bake. It's fun to watch them crawl up the sides of the baking dishes as they puff up. They come out of the oven big and puffy, but fall pretty quickly as they are brought to the table. We serve them sprinkled with powdered sugar and covered in maple syrup. They are delicious! And our family looks forward to eating these each year. Another Christmas tradition we have is making Christmas fudge. I've been making this fudge for years and years. I couldn't even tell you how many pounds of fudge I've made since I started making and sharing this fudge with our family and friends at Christmas. The recipe was given to my mom when I was a child. It's called See's Fudge. I don't know if it's really a recipe from See's or not. It has a smooth creamy texture and is delicious and quite popular with my family and friends. I'll share the recipe here on my blog in a future post. What about you? What are your Christmas traditions? Here's another of our family's favorites ~ Spritz Cookies. I usually make them during the Christmas season. They really are deliciously sweet, buttery cookies. Here's the recipe I use. I adapted it from the Wilton Spritz Cookie recipe found on the Wilton Spritz Cookie Press box that I've had for years. Preheat oven to 400°. Thoroughly cream butter and sugar. Add egg, milk, and vanilla; beat well. Stir together flour and baking powder. 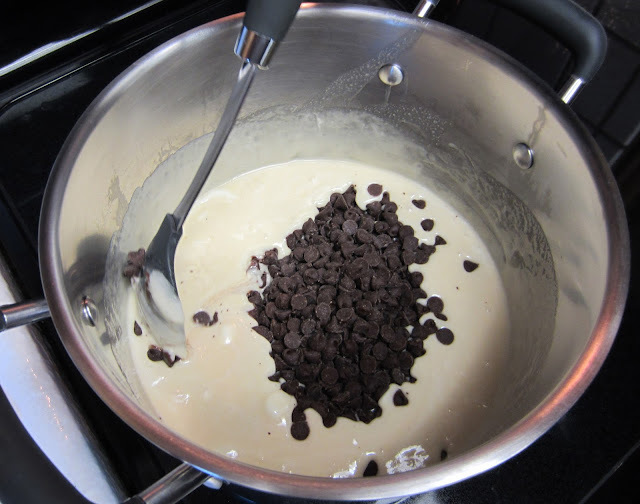 Gradually add to creamed mixture, mixing to make a smooth dough. Do not chill. Place dough into cookie press and press cookies onto ungreased cookie sheet. Decorate with decorating sugar crystals as desired. Bake at 400° 6 to 8 minutes. Remove cookies from sheet. Cool on rack. Enjoy! Recipe adapted from Wilton's Spritz Cookie Recipe found on Wilton Spritz Cookie Press box. If you've never used a cookie press, here's a helpful video about how to use one.